This blog post provides a walk-through to our new Chicken Soup Designs pattern: "Make It Your Own: Embroidered Tote Bag". 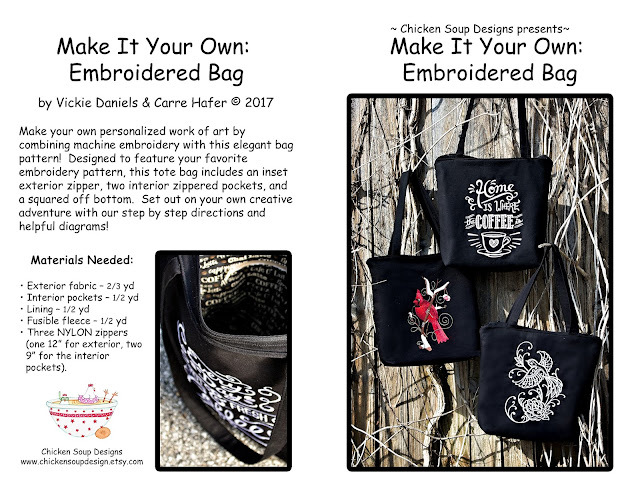 The pattern can be purchased on Etsy using this link or by contacting us via our Etsy Store! 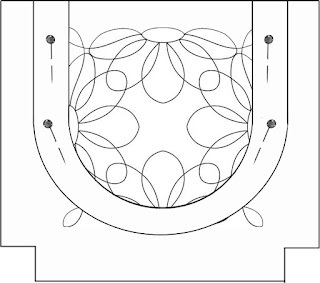 Refer to pattern to cut out and place embroidery. Embroider one (or both) of piece A. Cut the squares as directed from the two bottom corners of both A pieces. 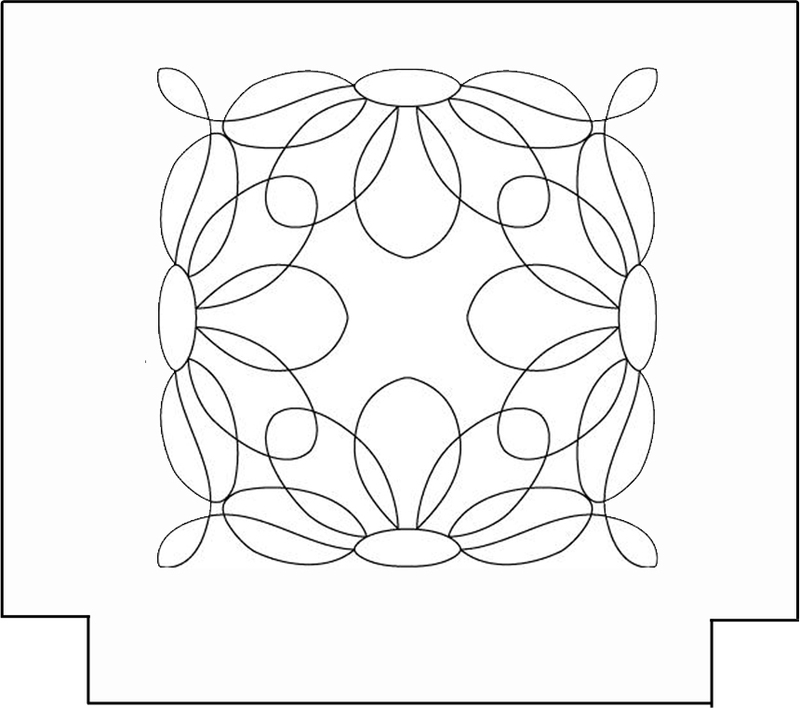 With E facing wrong side up, draw rectangle as specified (see Figure 2a). Place pocket fabric E on Bag Lining D (with right sides together), centered side to side with the top edges even. Stitch on the drawn line to make a stitched rectangle (see Figure 2b). 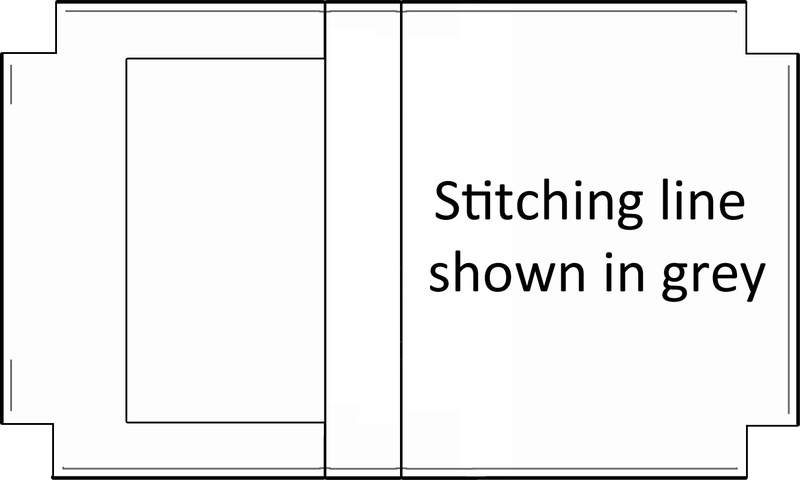 Cut a slit down the center of the stitched rectangle from one end to other. Stop about 1/4" from each end and cut diagonally into each corner. Pull the lining through the slit and press flat so the wrong sides are now together and you have a finished rectangle hole (now called F). 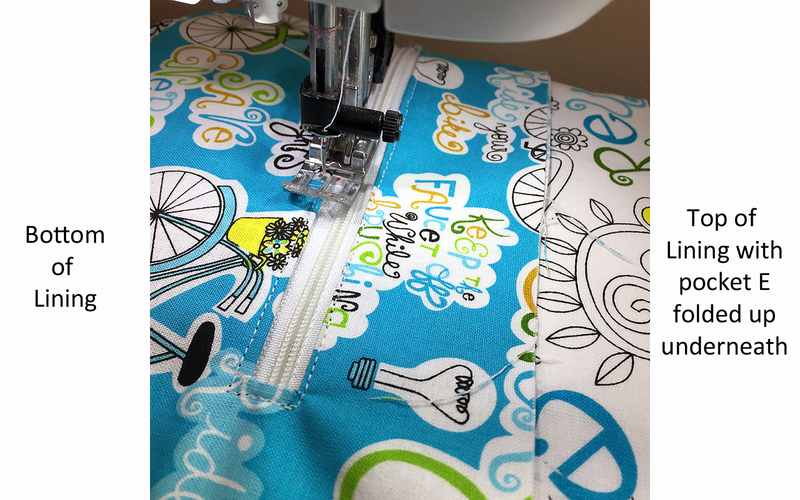 On the wrong side of E, flip the longer piece of the pocket fabric toward the top of F enfolding the lower edge of the zipper tape. 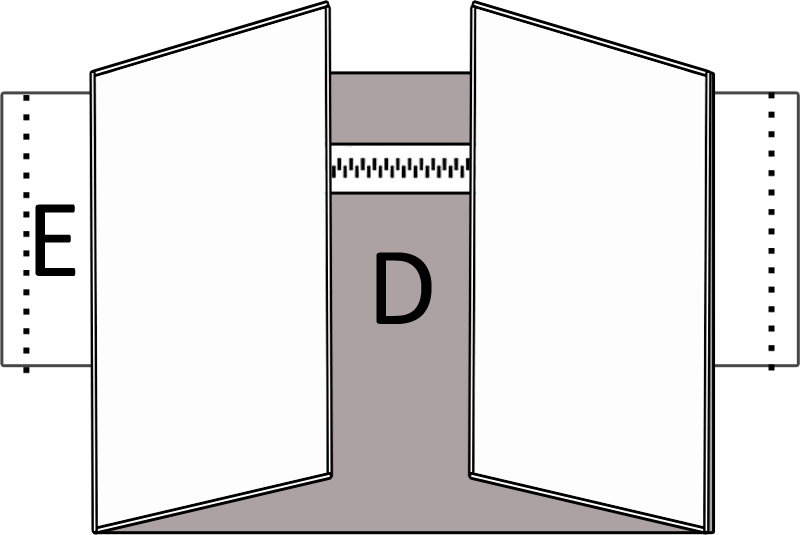 The fold should be right along the zipper tape. Pull it taut without folding the zipper tape. (See Fig 5A). Turn F over so the lining is facing up and you can see the zipper stitching. Stitch on the zipper stitching along the bottom of the zipper. Turn the piece over, and flip the fabric back down. The bottom zipper tape is covered. Fold the pocket fabric up so that the bottom edge of E is even with the top edge of F. Pin in place. Turn F over so the lining is facing up and you can see the zipper stitching. Stitch on the previous zipper stitching along the top of the zipper. 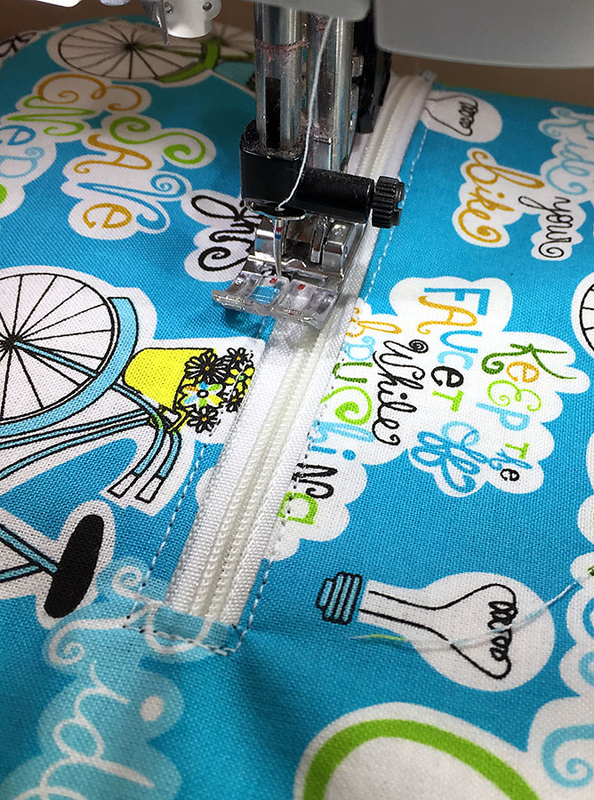 Now the top zipper tape is covered (see Fig 5B). 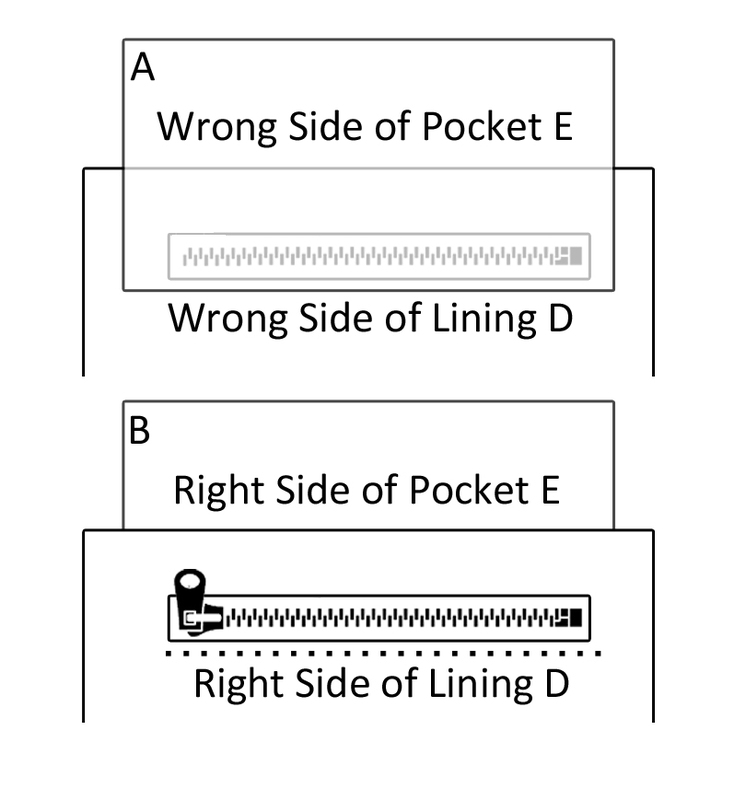 This picture shows pocket E folded up so that when stitched, it will cover the zipper tape. 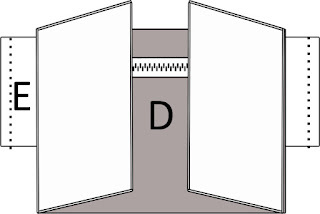 With the lining right side up and the zipper showing, fold each side of E and D at the ends of the zipper toward the center of the zipper, exposing the edges of the pockets (see Fig 5). Stitch from the top to the bottom of the pocket only, about 1/2” in from the raw edges. 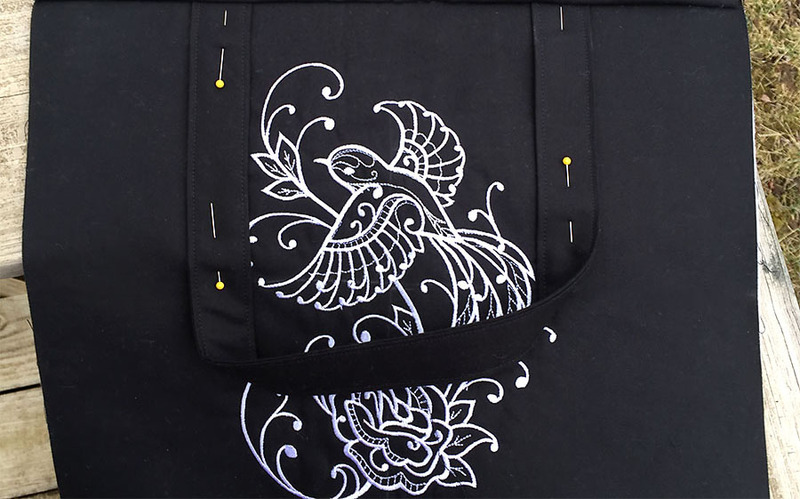 Do this at both ends of the zipper to make the sides of the pocket. 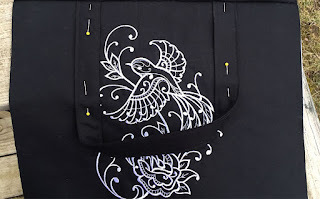 If you covered the zipper tape, then there will be a pleat in the pocket fabric at each end of the zipper. Just stitch over it like it’s not there. Fold the lining edges back out. This piece is now a completed lining with pocket. Repeat for the other lining piece. Stitch the two B pieces to the top of the two F pieces and press. Cut a the corner squares from the two bottom corners of both lining pieces (as specified in pattern). 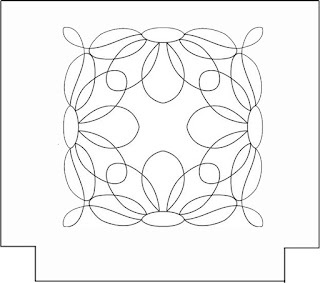 Refer to pattern to make G pieces. Slip G over the trimmed zipper ends and topstitch several times. Sandwich the zipper between two C pieces, right sides together. 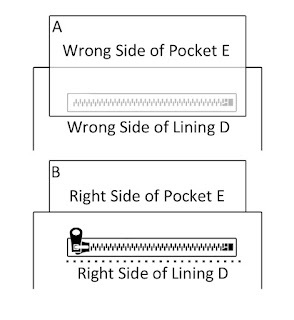 The zipper tape should be centered from end to end and even with the edges of the two C pieces. Stitch all the way from one end to the other (even though the zipper is not as long as the C pieces). Open out and topstitch all the way from one end to another with a 3/8” seam. Repeat for the other edge of the zipper. Place the zipper sandwich on one of the A pieces, right sides together. Baste. This picture shows the zipper sandwich basted to piece A and flipped up so you can see it better. Place one of the lining pieces, right side down, on top of the zipper/A piece. Stitch. Remove the handle pins. With the handles pulled out and the lining, zipper, and A facing the other direction, topstitch through all 3 layers starting at the point that is even with one end of the zipper and stitching to the point that is even with the other end of the zipper. Do not stitch all the way to either end. Do the same with the other A piece, zipper sandwich, and lining. Backstitch over handles to make sure they are securely attached. Picture shows handle pulled to one side, and lining, zipper, and A facing the other direction in preparation for topstitching. Lay the bag so the two A pieces are right sides together and the two lining pieces are right sides together. 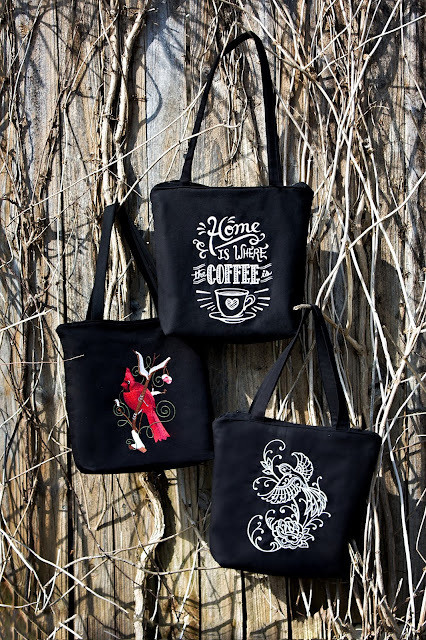 Stitch around the bag, skipping the cut-out corner squares. 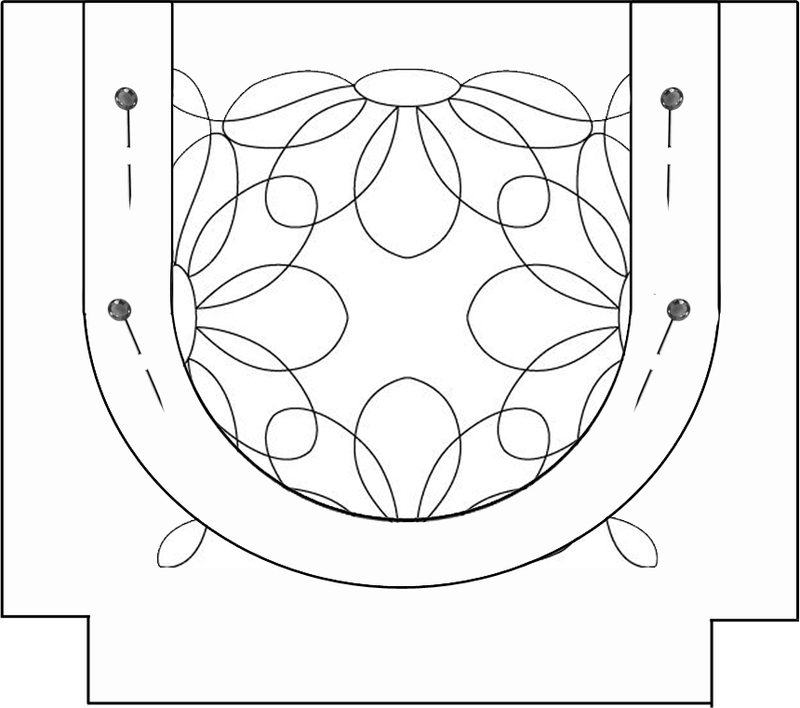 For turning, leave a generous opening in the center bottom of the lining. Matching the seams in the cut-out corners, stitch the corners closed (see Fig 11). Stitch the lining corner seam to the exterior corner seam to secure the lining in the bag. Turn the bag right side out and stitch the turning hole closed.